We hope you had as much fun with last week’s Ghostbuster’s Giveaway as we did! With Gozer and her party lights banished from our world and destined to haunt the mailbox/freezer of one lucky winner, we’re turning our attention this week to what has often been called the scariest film of all time, 1973’s The Exorcist. You might not know it, but The Exorcist was adapted from a book that was inspired by the 1949 exorcism of Roland Doe. It deals with the demonic possession of a young girl and her mother’s desperate attempts to win back her daughter through an exorcism conducted by two priests, Fathers Merrin and Karras. Continue on to see how you can win this truly frightening recreation of the iconic head-spinning scene from the film! 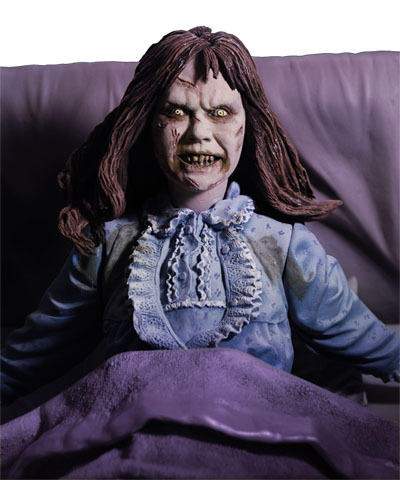 The 12-year-old Regan has been possessed by the devil, and only an exorcist can save her. This limited edition deluxe boxed set plays authentic theme music while the motorized head spins 360 degrees! Incredibly detailed set measures about 8x6x5″ and uses 2 AA batteries, included. 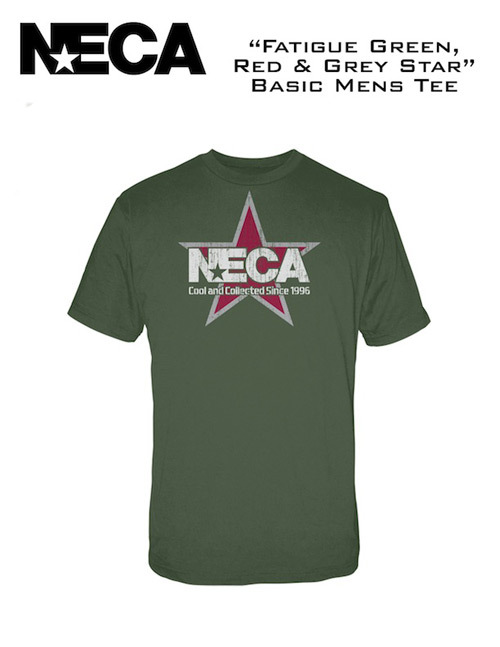 The winner will also receive this cool NECA T-shirt! 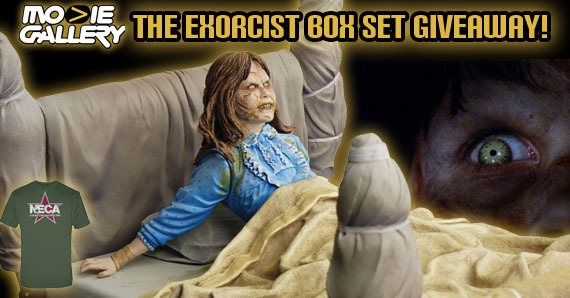 This entry was posted in Contests & Giveaways and tagged giveaways, the exorcist by mgadmin. Bookmark the permalink.